It is recommended to clear your cache in NinjaTrader on a regular basis. Sometimes this is required to resolve some issues you may be having with your charts as well. For example, if you've changed time zones on your computer, you will need to do this so your charts line up properly. The easiest and most effective way to accomplish this is with the Apex Toolkit. 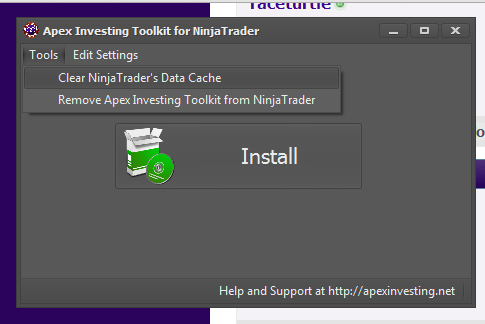 After launching the toolkit, click Tools > Clear NinjaTrader's Data Cache. You will be provided with a progress screen to let you know it's working and will go away once it's completed. Some times this process can take a while if you have a lot of data in history. This will permanently wipe the cache from your hard drive and not just stick it in Windows' recycle bin to take up valuable space. I'm getting this error when trying to run NT7. http://screencast.com/t/UvOECgQbiLiv I cleared cache on the toolkit already. I cannot open the toolkit with win10... get a authorization issue! !